Every week we pull together some great Canadian recipes from Canadian food bloggers around the web featuring one main ingredient or dish. This week, we're sharing over 30 hot and spicy dishes to add a little zip to your menu! Do you need a little more "zip" in your day to day life? Maybe you're dreaming of an exotic location with warm skies and colourful scenery. The hustle and bustle of busy food markets and street vendors selling delicious eats from the side of the road. Or maybe you're just tired of the same old same old and you want to add a little extra heat to your dinner table! Well we're here to help you spice things up in the kitchen. We've collected over 30 hot and spicy recipes from across Canada to raise the temperature wherever you are. There's everything from Jerk Chicken Wings (perfect for a game day snack) to Spicy Vegan Mapo Tofu and a Spicy Thai Peanut Sauce Pizza. Or try something sweet with Sweet Heat Almond Bars or Strawberry Chipotle Jam. And if you want to go all out try Dish 'n the Kitchen's Ethiopian Feast! Is it just us or is it getting hot in here?? Need a little help with spice basics? Check out our Spice Box for everything you need to know about what you should have in your spice cupboard to add a little extra zippity do da to your cooking! 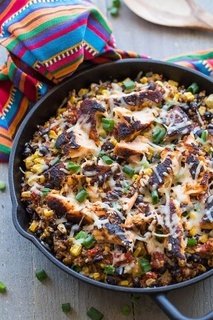 Now at first glance salmon might not cross your mind as an ingredient for a spicy meal but **Crumb Top Baking** has given salmon a hot new makeover (pun intended) with her **[Fiesta Quinoa Salmon Bake](https://www.crumbtopbaking.com/fiesta-quinoa-salmon-bake/)** that is all about the zip and the zing! **CulturEatz** created a **[Quick and Spicy Vegan Mapo Tofu](https://cultureatz.com/quick-spicy-vegan-mapo-tofu/)** by substituting chopped mushrooms for the usual minced meat so that it becomes an easy plant based dish! This smoky **[Karhai Chicken](https://www.flourandspiceblog.com/no-tomato-smoky-highway-karhai-chicken/)** from **Flour and Spice** packs a spicy punch but it's the charcoal aroma that will make it even more irresistible! **[Spicy Penne all'Arrabbiata](https://www.shelovesbiscotti.com/spicy-penne-allarrabbiata-sundaysupper/)** makes a quick and easy week night meal. **She Loves Biscotti** has whipped up a recipe that only needs a few simple ingredients (including hot chili peppers) and thirty minutes in the kitchen. There is so much flavourful goodness in this **[Smashed Cucumber Salad with Chicken Satay with Red Curry Peanut Sauce](http://www.rhubarbandcod.com/smashed-cucumber-salad-w-chicken-satay/)** from **Rhubarb and Cod**. Refreshing cucumber salad with the comfort of chicken satay and a spicy peanut sauce. It's a party for your tastebuds! Serve them on their own or over pasta - however you eat these **[Spicy Meatballs](https://www.chefsouschef.com/spicy-meatball/)** baked in tomato sauce and mozzarella from **Chef Sous Chef** you're gonna love the extra pop of spicy flavour they add to your dinner! Chicken Fajitas are a family favourite for a lot of us but why not give this classic a twist and make a pot of**[ Chicken Fajita Soup](http://www.oldcutkitchen.com/2018/02/07/chicken-fajita-soup/)** from **Old Cut Kitchen** to warm up with? This four for the price of one! **Dish n the Kitchen**'s **[Ethiopian Feast](https://www.dishnthekitchen.com/2017/03/31/around-the-world-in-twelve-plates-ethiopia/)** has recipes for Nit'ir Qibe, Misir Wot (Spicy Red Lentil Stew), Doro Wot (Ethiopian Spiced Chicken Stew and Kai Wot (Ethiopian Beef Stew). You'll be feeling the heat in no time! **[Sweet Heat Almond Bars](http://www.evergreeneats.com/sweet-heat-almond-oat-bars/)** from **Evergreen Eats** are the perfect healthy snack to help fuel your day. The secret ingredient in these bars? Sriracha! More Hot and Spicy Recipe Ideas!